The Great Pyrenees is one of several European livestock guardians. Livestock guardians do not herd their charges, but instead protect them. The Great Pyrenees traditionally guarded sheep, but it could also work with other livestock, living with their charges and fending off predators that included bears and wolves. In the past they have also been used as cart pullers and guard dogs. The Great Pyrenees hails from Andorra, France, which is located in the Pyrenees Mountains. Remains dating back to 1800 BC of a dog very similar to those seen today have been found in Europe, although its original ancestors most likely hailed from Asia. 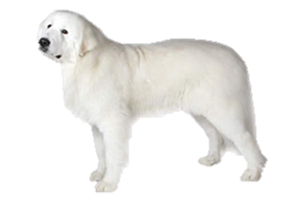 Descended from ancient mastiffs, the breed closely related to the Maremma Sheepdog, Kuvasz and Slovensky Cuvac. A dog of the commoners as well as royalty, the Great Pyrenees was quite popular with the French court from the Middle Ages to the 19th century. Louis XIV even gave them the title of Royal Dog of France in the 17th century.